Cellulase adsorption of lignocellulosic materials is the key link during enzymatic hydrolysis. Hot-washing process (above lignin glass transition temperature) was used to change the physical structure of lignin, decrease covalent connection between cellulose and lignin, reduce the concentration of inhibitor, and explore the feasibility of enzymatic hydrolysis. The general objective of the paper was conducted to determine whether the hot-washing process has the potential to change the mechanism of lignin on enzyme hydrolysis. Hot-washing was carried out at 151 °C for 20 min. The ratio of acid insoluble lignin to acid soluble lignin was increased, while the formation of spherical lignin droplets on the cell wall surface was decreased. Enzymatic digestibility of hot-washed filter cakes showed enhanced digestibility over the control samples. The concentration of fermentation inhibitor (acetic acid, formic acid, furfural and 5-hydroxymethylfurfural) obviously decreased after hot-washing process. Hot-washing process significantly increased the adsorption ability of cellulase on the substrates and digestibility of biomass without removing much of the insoluble lignin content. Lignin distribution and/or physical property composition play a role. Lignocellulosic biomass is recognized as a high-potential feedstock for bio-ethanol production. It contains polymers of cellulose, hemicellulose, and lignin which bound together in a complex structure. Ethanol can be made from cellulose via four main consecutive steps: pretreatment, enzymatic hydrolysis, fermentation, and separation. One of the major limitations in the cellulosic ethanol production is the enzymatic hydrolysis step (Sun and Cheng 2002), where fermentable sugars are released from biomass using enzymes. The success of enzymatic hydrolysis depends on the accessibility of the cellulose component to hydrolytic enzymes (Stauner et al. 2013). In steam explosion pretreatment, hemicellulose is solubilized, whereas lignin and cellulose remain mostly insoluble. Residual lignin consolidating the polysaccharide matrix interferes with the action of enzyme, leading to decreased hydrolysis yields and rates (Zhang et al. 2015). Enzyme adsorption onto lignin surface is considered as a major inhibitory mechanism in the enzymatic hydrolysis of cellulose (Sun et al. 2014), which is largely determined by the glassy state structure of lignin (Piccolo et al. 2010). Many pretreatment strategies, such as hot-water pretreatment, focus on removing a significant fraction of lignin from biomass to enable better hydrolysis. However, lignin is partially depolymerized and solubilized during hot-water pretreatment, but complete delignification is not possible, because of the recondensation of soluble components originating from lignin (Alvira et al. 2010). The “hot-wash” concept developed at National Renewable Energy Laboratory (NREL) uses hot water or hot dilute acid at temperatures above the lignin liquid/glass condensation temperature (T g) to wash out the solubilized lignin. The previous works have characterized the glass transition behavior of lignin, where it transforms from a hard or glass-like state into a rubbery or viscous state upon heating (Ko et al. 2015). Hot-water pretreatments reaching temperatures above the range for lignin phase transition cause lignin to coalesce into larger molten bodies that migrate within and out of the cell wall, and can redeposit on the surface of plant cell walls upon cooling (Donohoe et al. 2008). During cooling after pretreatment, coalesced lignin could harden and either became trapped within the cell wall layers or settle out of the bulk liquid phase, potentially depositing back onto the biomass surface. Typically, the solid fraction is separated by filtration. The solid fraction allows solubilized lignin to condense and precipitate out on the cellulosic residue interfering with the enzymatic hydrolysis of cellulose to glucose (Selig et al. 2007). Flow-through hot-water pretreatment, where the solids residence time is longer than that of the liquid, has been shown to effectively dissolve more lignin compared with pretreatments, in which liquid and solids have the same residence time (Mosier et al. 2005). This method also generates solids that are more reactive on enzymatic hydrolysis, because of removing the solubilized lignin. However, continuous flow-through operation is thought to use an excessive amount of water and energy (Liu and Wyman 2005). In this study, a pressure filter reactor was designed for solid–liquid separation during hot-water treatment. The separation temperature was above T g. Experiments were conducted to determine if the observed droplet formations do emerge from the biomass into the bulk liquid phase during pretreatment and whether or not they deposit back onto the biomass surface after pressure filtration. To understand the mechanism of lignin on enzyme hydrolysis, it is crucial to investigate the adsorption of cellulase on pretreated substrates. In addition, experimental sets were run in an attempt to determine whether the hot-washing process has the potential to affect the enzymatic saccharification of cellulose in the pretreated biomass. Steam explosion corn stover (ECS) was supplied by Henan Tianguan Group Co., Ltd. The composition of raw and pretreated solids was analyzed following the NREL standard procedures (Sluiter et al. 2008). All the experiments were performed in duplicate, with the average value reported. The pretreated solids were air-dried and milled to pass 40 mesh screen for compositional analysis. ECS was treated with different solutions (water, 0.5 % ethanol solution, 0.5 % sulfuric acid solution) in a self-made reactor (Fig. 1), with pressure filtration under 151 °C to give cakes. Approximately, 300 g of raw materials and 3000 mL of solution were loaded in the reactor. The pretreatment temperature was controlled at 151 °C, the heating time to maximum temperature was 10 min, and pretreatment time at the maximum temperature was set to 20 min. After pretreatment, the solid and liquid fractions were separated by filtration using a filter plate at the T g in the same reactor. The residual solid with water, ethanol, and sulfuric acid solution-treated ECS was named WECS, EECS, and SECS for the next assay and enzymolysis. Cellic CTec 2 (the cellulase product for the production of cellulosic ethanol from Novozymes) was measured to have a cellulolytic activity of 117 FPU/mL as determined in our laboratory. Filter paper activity (FPA) measurement was carried out according to QB2583-2003. Enzymatic hydrolysis was performed in 0.05 M sodium acetate buffer solution (pH 4.80) to control the same pH. Cellulosic substrates by hot-washing process were added to a 500 mL round-bottomed flask with a stir and diluted with acetate buffer solution, to get a final solid concentration of 250 g per liter. The enzyme loading of cellulose was 10 IU/g cellulose. The reaction mixtures were put in a water bath at 50 °C for 48 h.
In which, ACS is the adsorption capacity of substrate. where E b is the bound enzyme concentration (U/g substrate), E f is the free enzyme concentration (U/mL), K ad is the dissociation constant for adsorption (mL/U), S is the substrate concentration (g/mL), and E max is the maximum adsorption capacity in amount of cellulase per amount of substrate (U/g substrate). Sugar, furfural, 5-hydroxymethylfurfural (HMF), acetic acid, and formic acid were analyzed by high-performance liquid chromatography (HPLC) using an HPX-87H (300 × 7.8 mm) column operating at 60 °C. The eluent, 5 mmol/L H2SO4, was used at a flow rate of 0.5 mL/min using a refractive index detector. All samples were centrifuged for 5 min to remove the water insoluble substances and the supernatant filtered through a 0.22 mm filter before analysis. The T g measurements was conducted using a simultaneous thermal analyzer (NETZSCH, STA409PC, USA). Scanning Electron Microscope (SEM) analysis was used to investigate physical changes in the native and pretreated materials. Fourier transform infrared spectroscopy (FTIR) was conducted using a Spectrum One FTIR system (Perkin Elemer) with a universal attenuated total reflection (ATR) accessory. Sample spectra were obtained using an average of 32 scans over the range between 400 and 4000/cm with a spectral resolution of 4/cm. Differential scanning calorimetry (DSC) defined the T g as a change in the heat capacity when the polymer matrix goes from a glassy state to a rubbery state. This point was determined by a change in slope in DSC curves. As shown in Fig. 2, the observed T g value for ECS occurred at a temperature of 151.1 °C (T midpoint). In general, the T g of lignin ranges from 127 to 193 °C, depending on their source, the functional groups, intermolecular bonding (cross-link) type, etc. (Hatakeyama and Hatakeyama 2004). These ranges agreed well with our data. Once pretreatment temperatures rise above the phase-transition temperature for lignin, lignin is fluidized and mobility is permitted within the confines of the cell wall matrix. To understand the fate of lignin during the hot-washing pretreatment, the lignin content of the pretreated material was analyzed following the NREL standard procedure (Table 1). 89.47–92.07 % of the lignin initially present was recovered in all the pretreated solids. The percentage of lignin decreased from 40.43 wt% for ECS to 37.40 wt% for EECS mainly due to the solubilization of lignin after pretreatment. While most of the initial lignin was retained in the pretreated solids, changes in the ratio of acid insoluble lignin (AIL) to acid soluble lignin (ASL) were observed. The AIL/ASL ratio increased from 7.60 to 10.60 in the case of SECS. The increase in the AIL/ASL ratio indicated that lignin changed its chemical composition or structure during pretreatment and was consistent with the literature (Samuel et al. 2010). ASL may represent the low-molecular-weight and hydrophilic derivatives of lignin (Yasuda et al. 2001). As also shown in the increase of the AIL/ASL ratio, lignin structure was assumed to be changed to more condensed and less reactive type during pretreatment. The extent of enzymatic hydrolysis can vary among fiber areas with comparable lignin contents due to the differences in lignin were distributed. The main drawback of steam explosion pretreatment is the partially hemicelluloses degradation and the generation of some toxic compounds that can affect the following hydrolysis and fermentation steps (Oliva et al. 2003). The possible toxic compounds in ECS were organic acids, such as acetic acid and formic acid, furan derivatives, such as furfural, and HMF (Table 1). Several detoxification methods have been studied to reduce the inhibitory effect caused by these compounds on enzymes and yeasts. For example, after hot-water pretreatment, the solid fraction was washed with warm deionized water (80 °C) to remove inhibitors of cellulase enzymes (Zeng et al. 2012). However, owing to the additional cost in the overall process, detoxification should be avoided if possible. Due to filtering step under the high temperature, these compounds were separated from solid into the liquid phase. The concentration of these obviously decreased in solid samples after hot-washing process. The yield of formic acid in residual substrates decreased by about 90 %, and the concentration of acetic acid dropped from 0.29 to 0.035 % in SECS. The content of furfural and HMF was well eliminated. 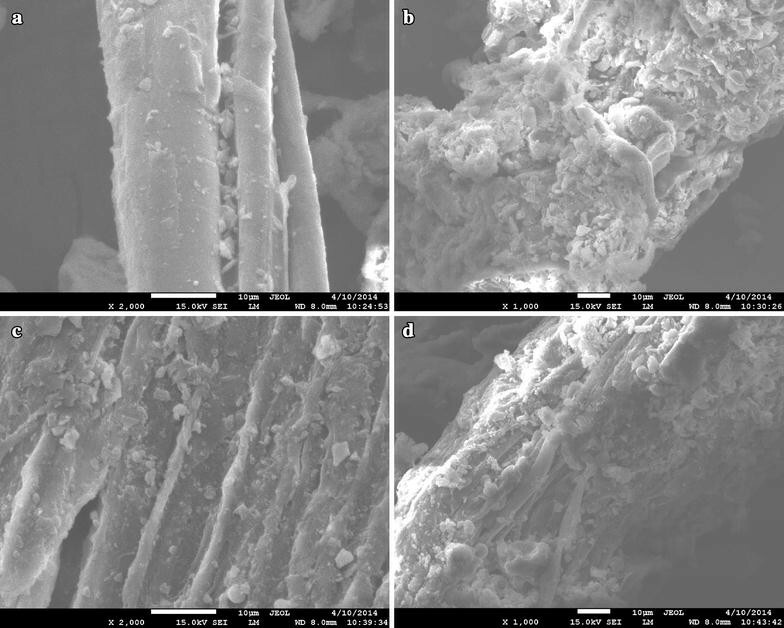 The change in the surface morphology during hot-washing steps was observed using SEM. Figure 3a showed the ECS, with very compact fiber structures due to the original structure of lignin. As seen from Fig. 3b–d, most small fragments attached on the surface of the substrate have been disrupted. The most noticeable change was the appearance of spherical droplets on the surface in hot-washing materials, while those were not found in ECS. It has been suggested that the formation or redistribution of lignin droplets on cell walls usually occurred during hydrothermal pretreatment. The morphological change of lignin was irreversible after cooling, similar structural changes have been reported earlier (van Dam et al. 2004). The deposition of droplets produced was shown to have a negative effect on the enzymatic saccharification of substrate. Compared with the traditional hydrothermal pretreatment, the overall surface droplet density generally decreased with hot-washing process and pressure filtration to give cakes above T g. This consequence of lignin deposition also agrees well with published findings regarding high temperature, flow-through pretreatment, which increases in the enzymatic digestibility of the pretreated material when portions of lignin were removed by washing during the pretreatment process (Archambault-Leger et al. 2012). FTIR spectroscopy was used to demonstrate the physical structure and functional groups of the lignocellulosic materials. The IR spectra of the untreated and treated materials were shown in Fig. 4. The characteristic peaks of cellulose (1167/cm , C–O–C vibration; 1375/cm , C–H deformation) existed indicated that after hot-washing treatment, the cellulose was not hydrolyzed. The hydrolysis of cellulose requires higher temperature. The peak in the 1233/cm was associated to the C–O stretching of the aryl group in lignin (Trodec et al. 2008). The decrease of this peak in all the hot-washing samples was believed to be due to the removal of free lignin after the chemical treatments. The typical bands at 1425 and 1501/cm represent aromatic ring vibrations of lignin (Sun et al. 2015). The intensity of methoxyl group at 1425/cm showed a decreasing tendency in all the hot-washing samples. The hydrolysis of methoxyl group can be attributed to the degradation of aromatic rings and breakage of ether linkages. During hydrothermal pretreatment, the depolymerized lignin by the cleavage of ether linkages undergoes condensation reaction with the formation of C–C bonding which is more rigid and less reactive (Li et al. 2007). By hot-washing process, the aromatic skeletal vibration at 1501/cm decreased. It illustrated that hot-washing process was able to destroy the aromatic skeletal carbon of lignin. Compared with the curve of ECS, the OH peak (3447/cm) of the treated samples can be observed. Combination with water during the pretreatment and the absence of some impurities may account for this. The first step in enzymatic hydrolysis of substrates is the adsorption of cellulase on the substrate cellulose surface. Furthermore, lignin is also reported to adsorpt cellulase enzymes in many studies (Kumar and Wyman 2009). Investigation of adsorption kinetics on lignocelluloses contributes to the understanding the enzymatic hydrolysis of lignocelluloses. Cellulase adsorption kinetics on four substrates samples were studied at 4 °C. At this temperature, enzymatic hydrolysis of cellulosic substrates was negligible. The results of adsorption kinetics were shown in Fig. 5. The results indicate that the adsorption kinetics on ECS was distinct from the other substrates. First, the equilibrium time for cellulase enzymes on ECS was over 50 min, longer than that on EECS, WECS, and SECS. Moreover, the pattern of adsorption kinetics curves of ECS and other substrates was considerably different. Amount of cellulase absorbed on ECS reached an equilibrium value (∼235 U/g) in 20 min. EECS, WECS, and SECS substrates were similar and had no obvious peaks for adsorption amount. Amount of enzymes absorbed on other cellulosic substrates increased to a maximum value (240–270 U/g) in 5 min and reached equilibrium plateau. The result suggests that enzyme adsorption on ECS was not stable and some enzyme could be released again after adsorption. Enzyme adsorbed on cellulose was a more rapid process than that of ECS according to the adsorption kinetics. Therefore, at the beginning of hydrolysis, the hydrolysis rate was high. With the increase of enzyme adsorbed on ECS, the decrease of hydrolysis rate was probably due to more unproductive binding of enzyme. To determine the adsorption isotherm of different substrates, enzymes preparations with various concentrations were carried out. The enzyme activity in the supernatant was determined. The data shown in Fig. 6 indicated that the adsorption isotherms on various lignocellulosic substrates were well fitted to the Langmuir adsorption model. The maximum adsorption capacity and Langmuir constant were obtained from adsorption isotherm and listed in Table 2. The data again revealed that there was obvious difference between cellulosic substrates. The maximum adsorption capacity of EECS was 1168.88 U/g of solid, which was about three times that of ECS (E max = 427.50 ± 19.53 U/g). The accessibility of lignocellulosic substrates was usually indicated by the maximum adsorption capacity, so EECS had more accessibility than ECS. Langmuir constant has often been used to evaluate the affinity of enzyme on different substrates (Min et al. 2015), although the actual adsorption behavior of enzyme on substrates may be not a reversible monolayer adsorption. The data in Table 2 showed that ECS had the lowest affinity (K ad = 0.013 ± 0.008 mL/U) to enzyme. In contrast to this, SECS which had the lowest adsorption capacity had the highest affinity (K ad = 0.028 ± 0.018 mL/U). The results suggested that WECS and SECS had more affinity than ECS. The effect on enzymatic hydrolysis of hot-washing materials was investigated at 50 °C. The results shown in Fig. 7 demonstrated that hot-washing process significantly enhanced the enzyme hydrolysis of cellulosic substrates. As an average, 71.90 % of cellulose conversion was attained of ECS. A significant increase was observed in the case of WECS (81.47 %), SECS (80.53 %), and EECS (85.18 %). The cellulose digestibility increased as a function of hot-washing pretreatment. Hot-washing process had a significant effect on ESC’s physic-mechanical properties. It suggests that upon melting under T g, lignin in biomass becomes fluid, coalesce, and has potential to move throughout the cell wall matrix. Hot-washing process significantly increased the adsorption ability of enzymes onto the substrates and digestibility of biomass without removing much of the insoluble lignin content. The amount of lignin alone was not sufficient to explain the different enzymatic hydrolysis characteristics of the fractions. Lignin distribution and/or physical property composition play a role. The concentration of fermentation inhibitor (acetic acid, formic acid, furfural, and HMF) obviously decreased after hot-washing process. Future work is focused on the industrial equipment, which can be carried out to pressure filtration under high temperature. XY wrote this manuscript. HLL, JYC, and SQF contributed general advice. XJM edited the manuscript. All authors read and approved the final manuscript.